While both the Samsung Galaxy Tab A 8.0 and Galaxy Tab A 9.7 do have their positives, with the great battery life a highlight, the low resolution displays and slower performance make it difficult to justify their relatively high price points when compared to the competition. After staying away from the tablet market for almost a year, Samsung introduced a new budget-friendly tablet series back in March. First launched in Russia, the Galaxy Tab A series has now made its way to other markets around the world, including the US. The two tablets that are currently a part of the series offer everything that you may love about the Samsung experience, and at an affordable price point. As is true in the Android world though, the competition in this space is quite intense, with some really good options out there. So are these devices worth it? We find out in this full review of the Samsung Galaxy Tab A 8.0 and Galaxy Tab A 9.7! On the design front, both tablets feature an all-plastic build, with a matte-finish back and a silver display frame. The plastic certainly feels cheap when talking about the overall feel, but at least it makes for a back that isn’t prone to fingerprints. There are parting lines to be found on the sides and the corners of both tablets as well. While that doesn’t necessarily impact the usage negatively, it is a testament to the somewhat disappointing build quality of these devices. Signature Samsung design elements make a return this time around as well, with the physical home button up front, flanked by capacitive back and recent apps keys, found below the display. There is no backlighting with these capacitive keys though. Moving around the device, the power button and volume rocker are found on the right side, the microSD card slot is placed on the left, and the microUSB port and headphone jack are both at the bottom. The speakers are also found on the bottom, with the larger Galaxy Tab A 9.7 featuring a dual stereo speaker setup, compared to the single speaker of its smaller sibling. On the back of both are the camera and two smart cover connectors that can be used with the Samsung Smart Cover and a handful of third-party cases. Both the Galaxy Tab A 8.0 and Galaxy Tab A 9.7 are thin and somewhat light, with a thickness and weight of 7.4 mm and 313 grams for the former, and 7.5 mm and 450 grams in the case of the latter. With the exception of an extra speaker, a slightly less protruding camera on the larger device, and of course, the overall size, both tablets share a similar aesthetic. It also worth mentioning that both of these devices come with a display with a 4:3 aspect ratio, and as a result, are slightly wider than what you’d expect to see on any other Android tablet. Both the Galaxy Tab A 8.0 and the Galaxy Tab A 9.7 feature TFT touchscreens with the identical resolution of 1024 x 768, resulting in unfortunately low pixel densities of 160 ppi and 132 ppi respectively. This low resolution is certainly disappointing, as it would be something you’d expect with a tablet that is far cheaper than the price for what these tablets are being sold. With that said, despite the noticeable lack of sharpness, both panels do offer vibrant colors and excellent viewing angles. Sunlight readability could be slightly improved, but the displays are definitely bright enough for standard indoor use. Also noticeable is a thin black border around each display that adds to the bezel of the device. This is a lot more evident on the white model, which could be an annoyance to some people. Under the hood, both tablets pack the quad-core Qualcomm Snapdragon 410 processor clocked at 1.2 GHz, and backed by the Adreno 306 GPU and 1.5 GB of RAM. This is quite the capable processing package, but things tend to feel a little slower than they should at times. The benchmark scores disappoint as well, and just like with the displays, this isn’t what you’d expect nor want with a device priced as high as these. The extra .5GB of RAM is pretty noticeable compared to devices with only 1GB, but unfortunately not by much. On the other hand, these tablets do handle gaming well, and while there is the occasional dropped frame, things remain smooth for the most part. Both tablets come with 16 GB of on-board storage, further expandable via microSD by up to 128 GB. Apart from the standard suite of connectivity options, a 4G LTE-capable version is also coming soon, which will also see the on-board storage and RAM bumped up to 32 GB and 2 GB respectively. The speakers on the Galaxy Tab A devices get reasonably loud, and sound pretty good overall. It is easy to block them when using the device in landscape orientation, though, which is an issue with pretty much all devices with side-firing audio. The larger 9.7-inch model has a slight advantage in this area with its dual stereo speakers, but the audio quality remains about the same when it comes to real world usage. One highlight when it comes to the Galaxy Tab A 8.0 and Galaxy Tab A 9.7 is the battery life, with the devices packing large 4,200 mAh and 6,000 mAh batteries respectively. Using each tablet with Wi-Fi enabled and the screen brightness set at 75% allowed for both devices to last just over 14 hours, with an impressive 7 hours of screen-on time in the case of the 8-inch model, and 8 hours of screen-on time with the 9.7-inch model. The power saving modes Samsung offers with its devices are also available here. Both devices come with 5 MP rear camera and a 2 MP front-facing unit. The rear camera allows for decent looking shots and will do in a pinch, but is certainly not capable enough to replace your primary mobile photography device. As far as the camera application is concerned, it isn’t as packed with features as is found with Samsung smartphones, but there are a few different modes, effects, and filters available that might help make up for the poor quality photos. 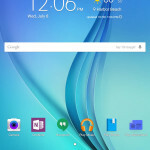 As far as the software is concerned, both devices come with Android 5.0.2 Lollipop with Samsung’s TouchWiz UI on top. These tablets also bring with them quite a few incentives on the software side, including the availability of six Microsoft applications pre-installed, along with the option to claim 100 GB of free cloud storage for 2 years with the use of Microsoft OneDrive. In addition, you also get a 3-month subscription to Next Issue, one free Kindle e-book every month for a year, three free audio books from Audible, and three months of access to SIRIUSXM radio for new users. When it comes to the user interface, some of the positives include quicker and easier access to the Quick Toggles menu, along with the ability to edit these toggles, a split view of the Settings menu, a “close all apps” button, and multi-window, which proves to be really useful on devices with large displays. What gets confusing is the number of duplicate apps you’ll see, such as two web browsers, two note-taking apps, two email apps, three music apps, and even two app stores. The launcher’s non-alphabetical organization method can also take some getting used to, and the default keyboard is mediocre at best. Of course, you always have the option of third-party launchers and keyboards to remedy these downfalls. So there you have it, a close look at the Samsung Galaxy Tab A 8.0 and Galaxy Tab A 9.7! Both of these tablets bring a lot of positives to the table, including good quality audio, fantastic battery life, and a few useful Samsung-exclusive software features. With that said, the low resolution display and slower performance make it hard to justify the price tag, especially with regards to the larger 9.7-inch version. There are some really good tablets that offer similar specs and features to these tablets, but are also cheaper. That turns out to be the biggest issue with the latest Samsung tablets, unless you’re absolutely sold on the Samsung experience.